The advantages of audio and video over IP communication, compared to traditional analog systems, are universally recognized today: one for everyone the reduction of the costs and of the installation time that you can get thanks to the ability to share the LAN with other systems that you have already installed. Where is already available a LAN, used to manage a computer network, the automation of production lines or, in the context of the security, to manage an access control system, a video surveillance system or an anti-intrusion system, it is easy and quick to install intercom systems, emergency call systems or public address systems by sharing the network with pre-existing services. These systems also offer a high degree of reliability in the hardware connection of the equipment due to the ability to make redundant data networks by simply make a ring connection of the network so that it is insensitive to interruption at any point. Another important element of evaluating the reliability of these systems is the type of protocol used. All available systems are based either on the adoption of a Session Initiation Protocol (SIP) or on the adoption of Peer to Peer (P2P) protocols; the first is basically the protocol used by most telephone exchanges, such as the popular Asterix, while the second is the one used in file exchange and in direct communication between computers such as take place in Skype. On systems using a client-server architecture based on the SIP protocol, in order to state the connection between two apparatuses it is necessary to have management server on which all individual users (clients) must be registered; the server mainly deals with managing the connection between the different clients: the connection request is addressed by the device making the call directly to the server and then the server connects it to the device destined to receive the call by starting the communication between the two clients. All in all, it is only the SIP server that is aware of the complete architecture of the system and, consequently, it is only thanks to the server that it is possible to establish the connection between two devices. It thus is obvious that the server represents a critical element in the overall architecture so much so that in highly reliable systems (such as emergency call systems), the adoption of a redundant server is often required. To overcome this disadvantage, it is possible to use systems with a server-less structure based on P2P communication protocols (literally "from equal to equal") where each device, called Peer, has the ability to connect directly to the device with Which must communicate without the intervention of any intermediate device such as the server. In these systems, the mapping of the addresses of all the apparatuses that make up the system is stored on board of each device and therefore each device can directly and independently manage the connection with any other unit of the system. It appears immediately and evident as a P2P system offers important benefits such as easy scalability (to add a new device it is enough to have a free IP address on the network and no server capacity expansions are required) and high reliability as it is not present No element (server) whose malfunction can affect the efficiency of the communication system. Ultimately, while the SIP is a system with "grouped intelligence", the P2P is a system with "distributed intelligence" and therefore less subject to malfunctions due to the failure of a single critical unit. The diagram on the left shows an emergency call and public address system on a multi-storey building such as a parking lot. By using the P2P, you will not have to intervene on the server that manages the network, but it will be enough to use only the switches by sharing them with other systems installed on the same network even if the are managed by the server. 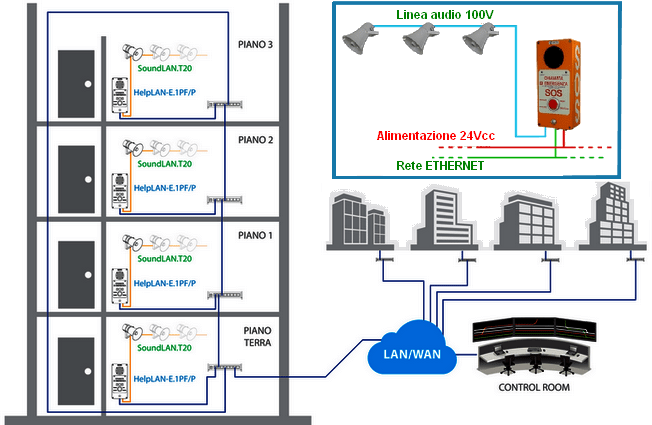 The lack of the server does not avoid the possibility to adopts solutions, such as the ring closure of the LAN, in order to make the network insensitive to a single cut or the ability to connect the system to a remote control room via WAN. If you need more information fill the form that you find HERE !